Situated on Italy’s enchanting Cavallino Treporti coast, Camping Cavallino is a great place for nature lovers to unwind in style. Both a beautiful sandy beach and a blue lagoon are located close to this leading LuxCamp, while the site itself also boasts an excellent range of first-class amenities. A number of great cycling trails can be found in this part of Italy and luxury camping lovers who like to be active are sure to be in their element. Several types of sports, such as basketball and volleyball, can also be practised right on the grounds of Camping Cavallino. 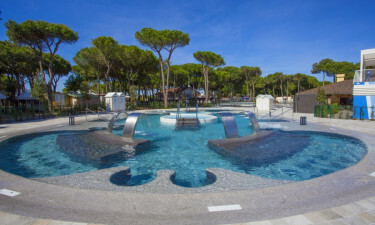 The special beachside pool at Camping Cavallino offers guests the best that luxury camping has to offer as they can keep cool that the pool while soaking up stunning seaside views. a separate pool for the little ones can also be found here as well as a relaxing whirlpool and waterslides. Guests at Camping Cavallino can take a short stroll from their mobile home to reach an impressive sandy beach. While this is a good place to soak up the sun, keen fishermen will also be in their element here.